Three of our five cottages have been officially graded Mobility 1 by Visit England. Mobility 1, means that a person is able to walk up a staircase with assistance, which might require as little as a handrail. More recently, two of our cottages, Woodpecker and Mole End have been graded as Mobility 2 which we are delighted about, having done a lot of alterations and work. It is a personal passion of ours that our cottages can be accessible whilst also being stylish. All the cottages have wide doorways and raised electrical sockets. All except the Piggeries have ramp level access to the main entrance. Each property also has their own washing machine and tumble dryer. These facilities are not shared and are provided in each cottage. I have tried to give a breakdown of the facilities in each cottage to ensure that guests book what is right for them. This cottage was assessed as Accessible Accommodation NAS Mobility 2 and is our largest and most spacious cottage. It has seven bedrooms, six of which have their own ensuites, two of which are on the ground floor. At the front of the property is a twin room on the ground floor this can also be made into a super king on request. The spacious bathroom (about 12ft by 5ft 6ins wide) has a large wet room type shower area. At the rear of the cottage, looking out into the woods, is a bedroom which contains a double and a single bed. This room can either be used by a family, parents and a child, or two adults. The large (again 12ft by 5ft 6 ins wide) en-suite consists of a modern washbasin, standard height toilet and large open wet room type shower area with fold down seat. Non-slip tiles to the floors. Also on the ground floor is a utility room with additional toilet and washbasin. The cottage has a conservatory / sun lounge, which is accessed off the kitchen area down some steps with a handrail. Unfortunately, there was no way of avoiding having steps to this new room. However due to the open plan space and it not being a closed off room, guests have found that it still allows everybody to gather and still feel included. There are some French doors leading from this room out to a new covered level seating area. This cottage has been great for large family groups, particularly with grandparents or relatives not good at walking or using wheelchairs. Parking is at the side of the property and there is ramp access to the front entrance. At the rear of the property is a raised decked area with tables and chairs in the warmer weather, this can be reached either by the French doors from the living area or by a permanent ramp from the garden path. Assessed as Accessible Accommodation NAS Mobility 2, there are three bedrooms, two of which are on the ground floor and both have en-suite wet room facilities. The double bedroom has a 5ft king size bed. There is a large bathroom (about 12ft by 5ft 6ins wide) non-slip tiles, with a wet room type shower area with rain shower, separate hose and level access (not a cubicle). A wheelchair can be wheeled under the basin and there is space either side of the basin to put toiletries/shaving items on. The large illuminated mirror comes right down to the basin, which mean that even when sitting in the wheelchair, you can see yourself in the mirror. There are grab rails above the bath, next to the toilet (with douche spray) and in the shower area. Whilst we have provided a drop-down seat in the shower area, if guests require to use a plastic shower chair, we do have those as well. The other ground-floor bedroom has a double and a single bed. This means that it can either be used as a family room, occupied by parents and a child, or by two adults and one gets a double bed. The en-suite (also 12ft by 5ft 6ins) has a large range of fitted cupboards, standard height. Again, the shower area is large with level access, all fully tiled with non-slip tiles to the floor. The shower hose can be detached from the sliding rail for ease of use. (This was suggested to us by one of the first guests that stayed in this cottage). On the first floor is a pretty twin bedroom accessed by an oak staircase in the living area. This also has an en-suite bathroom with bath, toilet and washbasin. 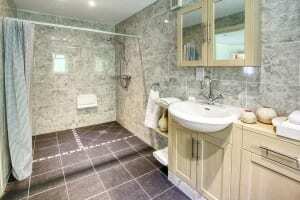 Additionally downstairs, there is also a separate utility room with a toilet and washbasin. This cottage has spacious rooms enabling someone in a wheelchair to manoeuvre around the cottage easily. Parking is next to the cottage, the driveway is tarmac to make pushing a wheelchair easier, and there is a ramp to the entrance door. This cottage is the most popular for families with a member who needs a ground floor bedroom or just friends who require the extra en-suite facilities. This cottage, assessed as Accessible Accommodation NAS Mobility 1, has three bedrooms, all of which are on the first floor. There is also a family bathroom upstairs. On the ground floor is a separate shower room with WC, so for someone who was not good at climbing stairs, once they had made the journey down in the morning, there would be washing / toilet facilities downstairs for them to use till it was time for them to go upstairs to bed. Cars can be parked in front of the cottage and there is ramp with level access to the entrance door. Again, at the rear of the cottage, reached by the lounge door, is a ramp leading down into the enclosed flagged garden area with a picnic table. This cottage is assessed as Accessible Accommodation NAS Mobility 1. To get to the main door there are five wide steps. Once inside, the original part of the building, comprises of a very large dining kitchen with breakfast bar and an inner hall to two en-suite bedrooms, one double and one twin room (which can actually be put together to make a superking size bed). The new building has a separate orangery style dining room. Off this dining hall, are two steps up to two large en-suite bedrooms. There is also a staircase down into a very large attractive living room which opens to a large conservatory. There are doors leading out the garden areas, making it a light and spacious cottage. However, due to the sloping site of the cottage, we cannot avoid having short flights of steps leading to the different living/sleeping areas and the landscaped gardens. In my honest opinion, the Piggeries is only suitable for guests that can manage a flight of stairs. It would not be suitable for any guests in a wheelchair. This cottage, assessed as Accessible Accommodation, NAS Mobility 1, is a large six-bedroom cottage. There are four bedrooms on the first floor. There is a shower room which has a shower cubicle. 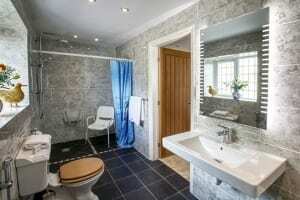 A family bathroom with bath with hand held spray, toilet and wash basin. On the ground floor are two double bedrooms with wooden frame type beds, which you would be able to slide a mobile hoist underneath if required. 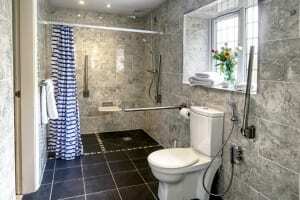 There is an additional ground floor shower room with a step into a cubicle type shower, toilet and washbasin. 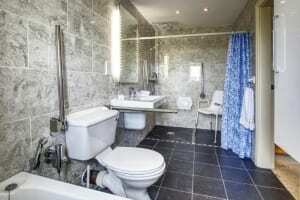 All the bathing facilities have been completely refurbished. 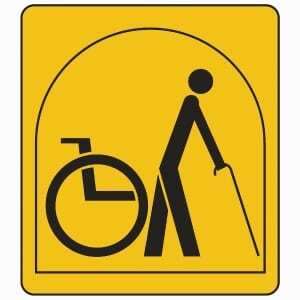 These ground-floor facilities are ideal for guests who are unable to climb stairs. There is ramp access to the main door and a ramp leading from the kitchen door to the enclosed flagged garden at the side of the property. The conservatory doors lead onto a large private garden accessed by a few steps. By using the front entrance you can enter the garden avoiding the steps. Parking is in the gravelled drive at the front of the cottage. The interior of the cottage is large and spacious, with ample room for persons of limited mobility to manoeuvre around the ground floor. A group of local businesses including ourselves and a variety of countryside organisations, have got together to develop the Wyresdale Wheels for all project, which means that there is now an all terrain buggy, the Tramper, which is available for hire. The Tramper is a specially designed, four wheel drive electric buggy, which can be used off road and even on rough ground, mud and grass. It enables people who have difficulty walking to experience the countryside, woodlands and lakesides; and to accompany their friends and families when out walking. The Tramper is available to use, for a donation for maintenance. You can use it for just a few hours or a few days subject to availability. You will be given a brief lesson on how to use the Tramper before you take it out for a drive. New trails are currently being developed. However, there are currently six routes that you can use to take you in the countryside within three miles of the cottages. These trails are also ideal for less agile walkers and people with buggies, as they are stile free and few steep slopes. Trampers are also available for hire from Beacon Fell near Chipping at Wyre Estuary Country Park and the Wild Boar Park also at Chipping. At these places you also need to book ahead. For more information please contact us and we can send you a leaflet giving more details. Should you require any equipment such as hoists, Millercare in Preston , (telephone 01772 788128), will deliver direct to the cottage prior to your arrival. For those guests who wish to hire various items of equipment, this company will provide ‘holiday hire’ and also deliver direct to the cottages. Their telephone number is 01995 679662. They also have a website. Our contacts there are Carol and Sam.